Performers include: Bob Vila, Steve Thomas, Kevin O’Connor, Norm Abram, Tom Silva, Richard Trethewey, Roger Cook, and Tedd Benson. Originally conceived as a one-time, 13-part series on the Boston PBS station WGBH, This Old House has grown into one of the most popular programs on the network. The series follows the remodeling of houses over a number of weeks, offering building insights and tips along the way. 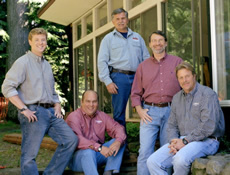 The series has inspired TV spin-offs like Ask This Old House, Inside This Old House and The New Yankee Workshop, as well as a popular do-it-yourself magazine. • This Old House was created by Russell Morash who had previously produced The French Chef with Julia Child and The Victory Garden for PBS. The idea for the show, the first of its kind, came to Morash while remodeling his own 1851 farmhouse. • Original host Bob Villa left the series in 1989 due to concerns over a conflict of interests once he began appearing in commercials for building products. In 1990, he began hosting a similar show, Bob Vila’s Home Again, and was a spokesman for Sears. • This Old House was the inspiration for the “show-within-a-show” Tool Time on the sitcom Home Improvement. Tim Allen played a Vila-like character and Vila guest-starred on the series as Tim’s rival. Tim’s assistant Al Borland was based on Norm Abram.